One of my units began to complain as if no gel applied a lot more at around 320 treatments so I started to ask about batteries. I'm really unconvinced the unit helped my leg at all. There is no doubt its existence delayed getting the exchange nailing I was so desperate for by several months§ and kept my head in a very bad place, but doubt it does any harm so would like to have it working to use until such time I am fully recovered. At the time of writing despite asking and chasing, Smith & Nephew's current service agents (or owners ?) Bioventus have not been forthcoming even with an answer on getting a new battery. They'd rather these things were disposed off. How much does the NHS pay for them again ? So I considered either replacing the battery pack myself or piggybacking an external power supply. My first thought was to try piggybacking a bench supply to take the unit well over 300 treatments. Though possible with careful power supply adjustment due to Lithium Thionyl Chloride chemistry doing this with the original battery present is a really bad idea. I've had quite a few emails asking how to open it. There are two screws that go into the pillars near the top of the picture and are under the white label on the back. You can feel the holes through the label. I used a plastic spatula tool (bought a long time ago for PCB resist transfers) to get the label off mostly intact. The micro is a Microchip PIC16C926. There's also a 32kx8 EEPROM and a diagnostic jack socket. 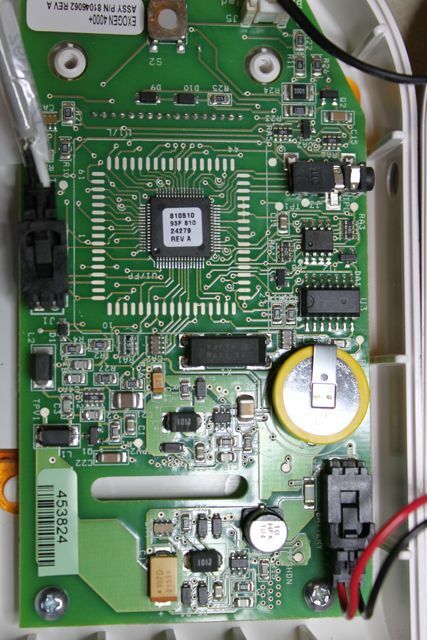 Maybe the EEPROM stores faults (like detected opens or shorts on the transducer) to tick boxes for medical devices. Data says the micro does not have any non-voltalile storage of its own so it is likely as a minimum the cycle counter stored in EEPROM. The big battery back is simply 5 off common Lithium Thionyl Chloride Cell type 14500. One or two suppliers seem to sell a suitable pack otherwise the cells are about £6 each from various suppliers and would not take a vast amount of soldering. (Likely the battery pack costs more than the electronics.) But making use of standard disclaimer you should not trust me at all so don't do this. From my and other people's experience you can safely replace this pack, the count will be maintainted (presumably in the EEPROM) and the machine carry on working beyond 400 treatments (in my own case). Not sure about the coin cell. Other site(s) imply the big pack can be replaced but the coin cell not without resetting things though I dare say if needed could be changed live. Maybe the layout is like that to take a socket for development. I've recently been told of an EXPRESS model that uses the same innards but with firmware that stops dead at 150 treatments. For another Bioventus branded machine featuring purple bits it might be 185.